The Origins Of The Shiite-Sunni Split : Parallels The division between Islam's Shiite minority and the Sunni majority is deepening across the Middle East. The split occurred soon after the death of the Prophet Muhammad, nearly 1,400 years ago. 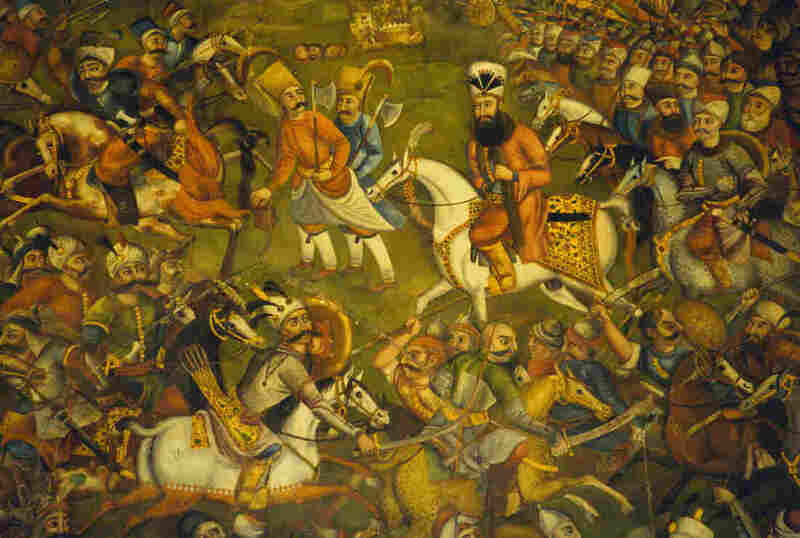 A fresco painting from the Chehel Sotun Pavillion in Isfahan, Iran, depicts Persian warfare during the Safavid dynasty period. Editor's Note: Back in 2007, NPR reported on the Shiite-Sunni split that was contributing to conflicts in many parts of the Muslim world, including Iraq. In light of the current fighting in Iraq, which is along sectarian lines, NPR is republishing the series. The text includes a number of updates, while the audio is from the original broadcasts seven years ago. Here is Part 1 of the series. 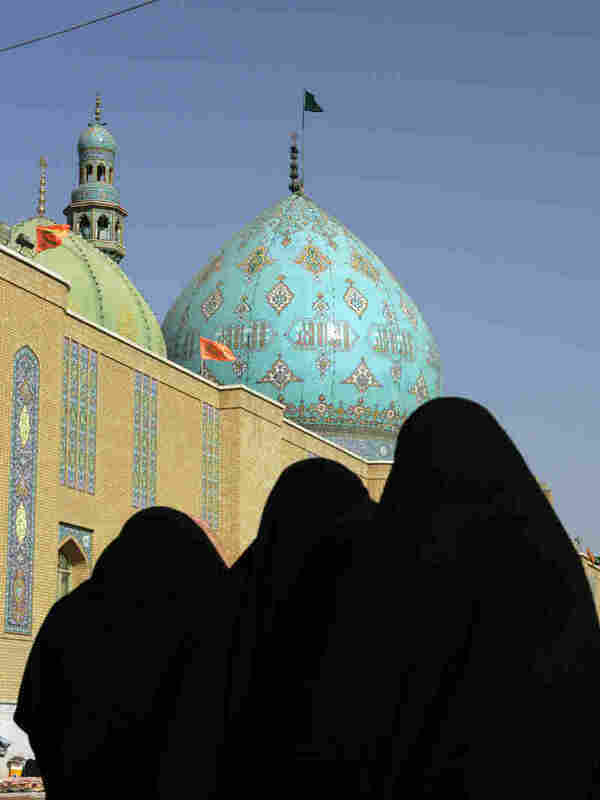 Women walk in the courtyard of the Jamkaran mosque outside the holy city of Qom, Iran, in 2006. It's not known precisely how many of the world's 1.6 billion Muslims are Shiites. The Shiites are a minority, making up between 10 percent and 15 percent of the Muslim population — certainly fewer than 250 million, all told. 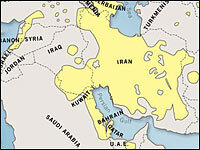 The Shiites are concentrated in Iran, southern Iraq and southern Lebanon. But there are significant Shiite communities in Saudi Arabia and Syria, Afghanistan, Pakistan and India as well. Although the origins of the Sunni-Shiite split were violent, over the centuries Shiites and Sunnis lived peacefully together for long periods of time. But that appears to be giving way to a new period of spreading conflict in the Middle East between Shiites and Sunnis. "There is definitely an emerging struggle between Sunni and Shia to define not only the pattern of local politics, but also the relationship between the Islamic world and the West," says Daniel Brumberg of Georgetown University, author of Reinventing Khomeini: The Struggle for Reform in Iran. That struggle is playing out now in Iraq, but it is a struggle that could spread to many Arab nations in the Middle East and to Iran, which is Persian. One other factor about the Shiites bears mentioning. "Shiites constitute 80 percent of the native population of the oil-rich Persian Gulf region," notes Yitzhak Nakash, author of The Shi'is of Iraq. Shiites predominate where there is oil in Iran, in Iraq and in the oil-rich areas of eastern Saudi Arabia as well. Reprinted from 'The Shia Revival' by Vali Nasr. Copyright 2006 by Vali Nasr. With permission of the publisher, W.W. Norton & Co.
Where Sunnis and Shia live in South Asia and the Middle East. The original split between Sunnis and Shiites occurred soon after the death of the Prophet Muhammad, in the year 632. "There was a dispute in the community of Muslims in present-day Saudi Arabia over the question of succession," says Augustus Norton, author of Hezbollah: A Short History. "That is to say, who is the rightful successor to the prophet?" Most of the Prophet Muhammad's followers wanted the community of Muslims to determine who would succeed him. A smaller group thought that someone from his family should take up his mantle. They favored Ali, who was married to Muhammad's daughter, Fatimah. "Shia believed that leadership should stay within the family of the prophet," notes Gregory Gause, professor of Middle East politics at the University of Vermont. "And thus they were the partisans of Ali, his cousin and son-in-law. Sunnis believed that leadership should fall to the person who was deemed by the elite of the community to be best able to lead the community. And it was fundamentally that political division that began the Sunni-Shia split." The Sunnis prevailed and chose a successor to be the first caliph. Eventually, Ali was chosen as the fourth caliph, but not before violent conflict broke out. Two of the earliest caliphs were murdered. War erupted when Ali became caliph, and he too was killed in fighting in the year 661 near the town of Kufa, now in present-day Iraq. The violence and war split the small community of Muslims into two branches that would never reunite. The war continued with Ali's son, Hussein, leading the Shiites. "Hussein rejected the rule of the caliph at the time," says Vali Nasr, author of The Shia Revival. "He stood up to the caliph's very large army on the battlefield. He and 72 members of his family and companions fought against a very large Arab army of the caliph. They were all massacred." Hussein was decapitated and his head carried in tribute to the Sunni caliph in Damascus. His body was left on the battlefield at Karbala. Later it was buried there. It is the symbolism of Hussein's death that holds so much spiritual power for Shiites. "An innocent spiritual figure is in many ways martyred by a far more powerful, unjust force," Nasr says. "He becomes the crystallizing force around which a faith takes form and takes inspiration." The Shiites called their leaders imam, Ali being the first, Hussein the third. They commemorate Hussein's death every year in a public ritual of self-flagellation and mourning known as Ashoura. The significance of the imams is one of the fundamental differences that separate the two branches of Islam. The imams have taken on a spiritual significance that no clerics in Sunni Islam enjoy. "Some of the Sunnis believe that some of the Shia are actually attributing almost divine qualities to the imams, and this is a great sin," Gause says, "because it is associating human beings with the divinity. And if there is one thing that's central to Islamic teaching, it is the oneness of God." This difference is especially powerful when it comes to the story of the 12th Imam, known as the Hidden Imam. 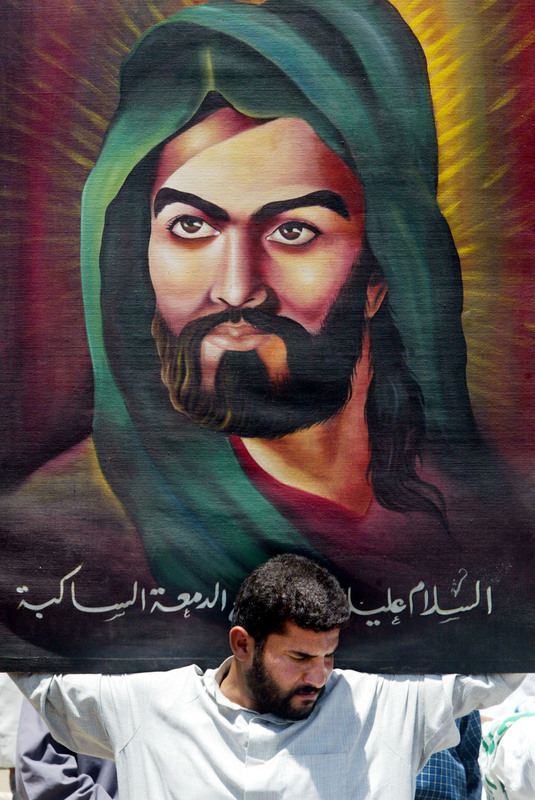 A Shiite Muslim holds a picture of historic Shiite leader Imam Hussein during an anti-American demonstration in Baghdad, May 29, 2003. "In the 10th century," says Nasr, "the 12th Shiite Imam went into occultation. Shiites believe God took him into hiding, and he will come back at the end of time. He is known as the Mahdi or the Messiah. So in many ways the Shiites, much like Jews or Christians, are looking for the coming of the Messiah." Those who believe in the Hidden Imam are known as Twelver Shiites. They are the majority of the Shiites in the world today. "Twelver Shiism is itself a kind of messianic faith," Georgetown's Brumberg says. It is based "on a creed that the full word and meaning of the Koran and the Prophet Muhammad's message will only be made manifest, or real and just, upon the return of the 12th Imam, this messianic figure." Over the next centuries, Islam clashed with the European Crusaders, with the Mongol conquerors from Central Asia, and was spread farther by the Ottoman Turks. By the year 1500, Persia was a seat of Sunni Islamic learning, but all that was about to change with the arrival of Azeri conquerors. They established the Safavid dynasty in Persia — modern-day Iran — and made it Shiite. "That dynasty actually came out of what's now eastern Turkey," says Gause, the University of Vermont professor. "They were a Turkic dynasty, one of the leftovers of the Mongol invasions that had disrupted the Middle East for a couple of centuries. The Safavid dynasty made it its political project to convert Iran into a Shia country." Shiites gradually became the glue that held Persia together and distinguished it from the Ottoman Empire to its west, which was Sunni, and the Mughal Muslims to the east in India, also Sunni. This was the geography of Shiite Islam, and it would prevail into the 20th century. There were periods of conflict and periods of peace. But the split remained and would, in the second half of the 20th century, turn out to be one of the most important factors in the upheavals that have ravaged the Middle East. "Why has there been such a long and protracted disagreement and tension between these two sects?" asks Ray Takeyh, author of Hidden Iran: Paradox and Power in the Islamic Republic. "It has to do with political power." In the 20th century, that meant a complex political dynamic involving Sunni and Shiites, Arabs and Persians, colonizers and colonized, oil, and the involvement of the superpowers.